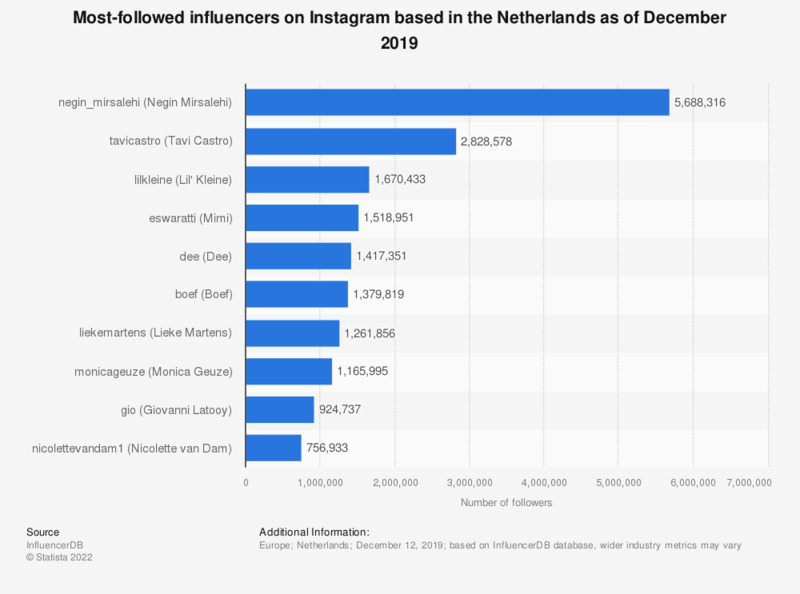 In July 2018, Tavi Castro had the highest number of Instagram followers of all influencers coming from the Netherlands. The bodybuilder and DJ combined two popular trends that can be found in this ranking: influencers either have a background in music such as rapper Lil’ Kleine or pop artist Marco Borsato, or they were beauty vloggers who already acquired fame. Examples of the latter were Moroccan Dutch “Mimi” or Meryem van Os-Karin, Monica Geuze, “Gio” or Giovanni Latooy and television presenter Nicolette van Dam. The social media platform is among the most used apps in the Netherlands. The numbers provided in this ranking indicate worldwide followers of Dutch Instagrammers. This does not mean, however, they do not have an audience in the Netherlands. The online reach of the brand Instagram, usually defined in marketing as the percentage of visitors that visited specific content at least once during a certain period, was over 50 percent in January 2019. When compared to the rest of Europe, the Netherlands ranked among the top countries when it came to Instagram use. At the end of 2018, only Norway, Sweden, Denmark and Turkey saw a larger share of their population that used the photo application.